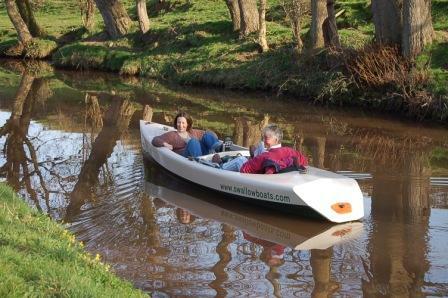 Back in 2005/2006, Swallow Boats in partnership with The Prospectory, developed a beautiful, sleek 17 foot pedal powered boat for exploring rivers and lakes in a low-effort, fun and environmentally friendly way. The project was called “Winsome” after my late aunt who always loved the outdoors and (unknowingly) partly funded a small part of the project! Swallow Boats did a fantastic job on the beautiful and highly efficient hull design and the extremely tricky technology of the engine mechanism and propellor. It was always important to us all that the boat could be pedalled with very little effort and as quietly as possible and that she looked good on the water. There are 4 Winsomes in existence (mostly fibreglass) and we still enjoy pedalling ours along the Mon & Brec canal where we live to get an evening beer in Talybont on Usk. We also we make the occasional longer (overnight) trips on the Thames or Norfolk Broads. 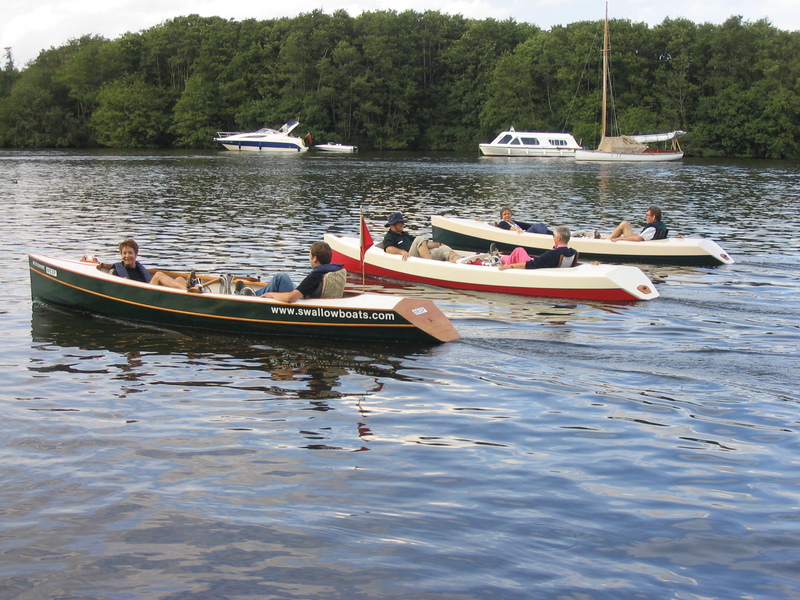 We originally got the idea for such a pedal boat from David Williams in Horning on the Norfolk Broads. He had built a version (Cyclone) for his young family to enjoy back in the 70’s. Anyway, we were delighted to see today that the original prototype Winsome (the only one built in wood) has got a new life as a hire boat from Freedom Dayboats on the Norfolk Broads. Let’s hope many more people are able to enjoy the unique experience of “Winsoming” as a result. This entry was posted in General information and tagged Swallow boats, The Prospectory, Winsome pedal boat. Bookmark the permalink. Very impressed with your efforts to promote ‘green ‘boating’. I had a go years ago with limited success. After selling our canal boat in 1999, I’ve dabbled making small boats, I thought I might have another go at building a human powered canal cabin cruiser. (not too ambitious!) My engineering skills are a bit limited, but good with fibreglass, can you recommend someone who could help me construct a twin/side by side/pedal prop drive unit. Perhaps create a Brecon Canal ‘Green’ event some time in the future!